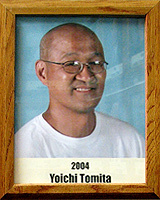 Yoichi attended Cal State University in Long Beach, Calif., where he competed in gymnastics. In 1978 he received the Heisman Trophy of Gymnastics, the Nissen-Emery Award, presented to the outstanding senior college gymnast. Besides being an Award for Gymnastics Excellence, the winner must be an example of good sportsmanship and fair play, a champion in defeat as well as victory. He also must maintain a high standard of scholarship throughout his college career. Yoichi was that and more. He came to Tucson to teach gymnastics and has been doing so for more than 21 years at his three gyms located around Tucson. His expertise in coaching is well known and he has been an assistant coach for the U.S. Olympic team in 1988, at the World Championships in 1999, and in the 2000 Olympic Games in Sydney, Australia. A former U.S. National team member himself, success runs in his family with son Yewki also a national team member and a 1999 World Championship team member. Yoichi’s daughters Sakura and Naomi have competed in the Junior Olympic Nationals. In 2004 Tomita was on the selection committee that chose the U.S. men’s team for the Olympics in Athens, Greece. All anyone has to do is an internet search for Yoichi Tomita and they will find dozens of articles and stories on athletes, male and female, he has successfully coached for the Olympics and national competitions.